Oh boy! This post is going to make my aunt in Malaysia so happy that I am already dizzy with excitement as I type. Su Athai (dad’s sister in Tamil) is a tea drinker and coffee hater. When I say hater, I mean the most powerful hate for caffeine ever. There was only one problem with this: It meant deeming most of the household untouchable during coffee-time in the morning and evening because South Indians generally love their filter coffee with a vengeance. Hence, when I became old enough drink coffee (18 years was the “acceptable” age at home), I joined the bandwagon of coffee drinkers much to the dismay of Su athai. We share a special bond and I think she sub-consciously felt that I was cheating on her. This didn’t stop us from enjoying our rare coffee/tea-time tête-à-tête back at home when she visited, of course. Every time she would stay over, my sister and I would crack the same old joke: we would take deep swigs off our coffee mug and ask her if she wanted some. This goofing around never gets old because I remember doing it to her during my 2012 India trip too. Boil the milk and water over med-low heat until it starts forming a layer on top. Skim it and add the spices. Let it boil for two minutes more. Add the tea leaves and sugar. Switch to low and let it simmer for ten more minutes. The idea is for the tea leaves and spices to steep in the milk and flavor it as much as they can. When done, strain through a tea sieve. Enjoy! *I’ve always found that Indian tea works the best for this Chai because of its wonderful strong flavor. Unfortunately, Indian tea producers haven’t started making decaf teas yet so I am pretty sure your favorite brand of decaf tea would work too. ***Normally ginger powder would work too but I strongly suggest that you use fresh ginger for a delicious earthy taste. It is exactly like choosing fresh basil over dried in pasta dishes. I have served the tea in glasses because that’s how they do it in Indian roadside tea stalls. 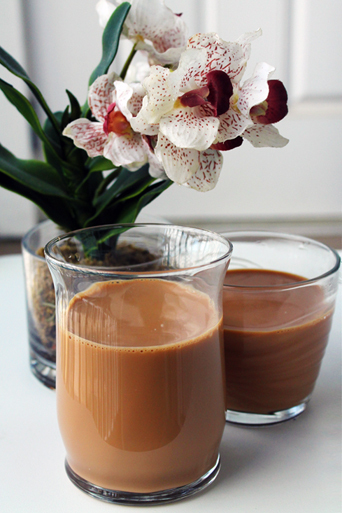 The taste of their Masala tea is unparalleled, of course! Categories: Beverages, Chennai, Family, Food, Indian, Recipe | Tags: amma, athai, chai, coffee, masala chai, sweet, tea | Permalink.